Show that you know first aid for the types of injuries that could occur while orienteering, including cuts, scratches, blisters, snakebite, insect stings, tick bites, heat and cold reactions (sunburn, heatstroke, heat exhaustion, hypothermia), and dehydration. Explain to your counselor why you should be able to identify poisonous plants and poisonous animals that are found in your area. Explain how a compass works. Describe the features of an orienteering compass. In the field, show how to take a compass bearing and follow it. Explain how a topographic map shows terrain features. Point out and name five terrain features on a map and in the field. Point out and name 10 symbols on a topographic map. Explain the meaning of declination. Tell why you must consider declination when using map and compass together. Show a topographic map with magnetic north-south lines. Show how to measure distances using an orienteering compass. Show how to orient a map using a compass. Set up a 100-meter pace course. Determine your walking and running pace for 100 meters. Tell why it is important to pace-count. Identify 20 international control description symbols. Tell the meaning of each symbol. Show a control description sheet and explain the information provided. Explain the following terms and tell when you would use them: attack point, collecting feature, aiming off, contouring, reading ahead, handrail, relocation, rough versus fine orienteering. Take part in three orienteering events. One of these must be a cross-country course. a list of your major weaknesses on this course . Describe what you could do to improve. Set up a cross-country course of at least 2,000 meters long with at least five control markers. Prepare the master map and control description sheet. Set up a score-orienteering course with 12 control points and a time limit of at least 60 minutes. Prepare the master map and control description sheet. Act as an official during an orienteering even. This may be during the running of the course you set up for requirement 8. 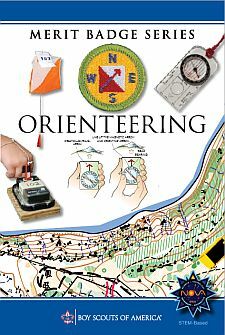 Teach orienteering techniques to your patrol, troop or crew. While orienteering is primarily an individual sport, BSA Youth Protection procedures call for using the buddy system. Requirement 7a can be completed by pairs or groups of Scouts.